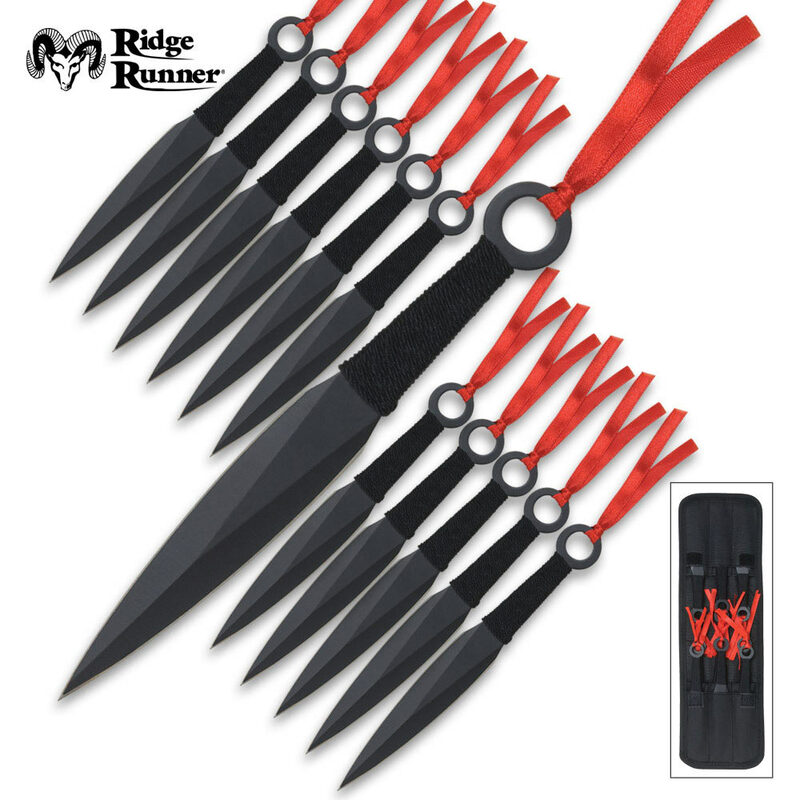 Brush up on your throwing knife skills with this 12-piece dozen throwing knife collection. All 12 of these bad boys feature one-piece, solid stainless steel construction with a heat-treated black finish. Razor-sharp edges and piercing points guarantee deep target penetration, and the open-hole pommel design and well-balanced weight proportion ensure a quality throw with each release. Decorative red ribbons complete the design. Includes a nylon sheath. 6-1/4" overall. I read the reviews. The blade does not have to be sharp but the tip has to be it a throwing knife not design for cutting. As far as the ribbon I will work on it. this is my first set of throwing knives for the price of 12 I have room to practice. The blade it self in much smaller than expected. As for balance the weight is right. They do need skill to be thrown at any decent distance, but they will stick. Best for short range about 3 - 5 feet. Fun but not real kunai. The edge itself is only sharp on the very tip of the blade, so it isn't any good at cutting. It is a good first set buy for a child, but not for an adult. It does make a great makeshift stitch breaker for patches, though. Great set of knives and easy to throw. They stick 95% of the time. The sting on the handles comes off but it is not necessary anyway. You get what you pay for I guess. Advertising does not do justice, they make it sound like these are kunai; they are 3" pieces, hardly sharpened scraps of metal. These knives are closer to ninja needles than knives. While the point was sharp enough to put into cottonwood targets, it was not an easy feat with these small light blades. I even tried to further sharpen them to realize the blades are not fully formed (there is more like the visual illusion of a sharp edge). Again, I got what I paid for, not as great a deal as you may think.